Here at Fuel Card Services we are proud to unveil a new product that significantly bolsters our range of services to our customers – BP’s new Fuel Price Guarantee. A new fixed pricing option for fuel card holders, this new product aims to help to reduce one of the largest areas of expenditure for all fleet operators, in determining a maximum price for the fuel they purchase. Benefits of the product include a potential for significant savings, as well easier budgeting, enhanced cost control and improved efficiency – drivers will no longer have to travel between filling stations looking for the best deals. BP’s Fuel Price Guarantee product operates across the company’s entire filling station network throughout the UK – more than 1,200 sites and counting. Other benefits for customers include the ability to earn Nectar Points with every purchase*, as well as greater security and peace of mind with individual PINs for fuel card holders, and access to an extensive range of partner sites, including Texaco and Gulf**. Click here and start controlling your diesel fuel costs with BP’s Fuel Price Guarantee. *Excludes Marks and Spencer branded products. 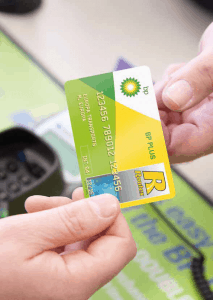 ** The capped price doesn’t apply at other sites accepting BP PLUS fuel cards, for example Gulf or Texaco stations.